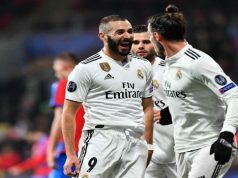 Real Madrid suffered their first defeat of the season as they lost 3-2 at Sevilla and saw Barcelona move top of La Liga. Rafa Benitez men were unlucky, as they missed many good chances to score and they lost Sergio Ramos after just 20 minutes. The Spanish defender scored a stunning goal to make it 0-1 as his scissor kick found the bottom left corner of the net, but in the process he aggravated his shoulder injury and had to leave the field. Gareth Bale put in a good performance as he returned from a few weeks on the sidelines, and he was close to doubling Real’s lead as he curled one from the edge of the box, but Rico managed to push it wide of the post. 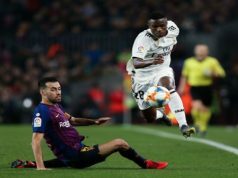 Sevilla were not playing good football but the managed to draw before the break as Immobile converted from a wide angle after a corner had somehow been allowed to reach the far post. The hosts took the lead just past the hour as Ever Banega converted from close range after receiving a super low cross from Konoplyanka. 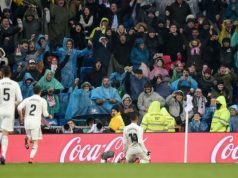 James Rodriguez also made his return from injury as he replaced Isco and he had a big impact in the game, but goalkeeper Sergio Rico denied every Los Blancos chance to level. Sevilla ended up sealing the victory as Llorente headed a super Mariano cross into the back of the net. James Rodriguez shortened the hosts lead with a shot to the bottom corner in stoppage time, but it was already too late to savage a point. Dear fans, we have to recognize that Rafa B is not proving to be the coach for the Real Madrid. To me, the way the players play reflects the way they are trained to play. His tactics don’t work. The team can control the game without creating net opportunities to score. It’s obvious that Ronaldo does play at his maximum level right now, but he never got replaced. Lack of aggressivity in the game, too slow on the attack. Franckly, the team needs a real boost to win La Liga. We are waiting to see another year of disappointment.